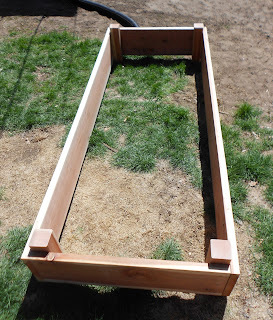 We decided to make two garden boxes for our backyard. The size we decided to made our boxes was 3ft x 8ft. We, also, wanted the option of placing solar lights on the boxes to light up our backyard. I read a lot on what wood to use and everywhere said two best was Redwood or Cedar, do NOT use treated wood can affect your veggies. Also, make sure you use screws that will not rust over time. 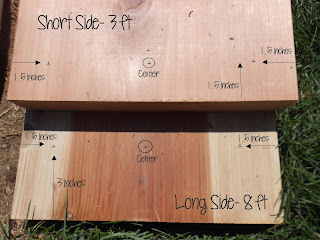 First, we looked at all our wood and decided what we wanted showing and what we did not. You need to look at the knots in the wood and make sure you do not cut to close. After deciding the look and best way to cut, its time to mark #3 of the boards. 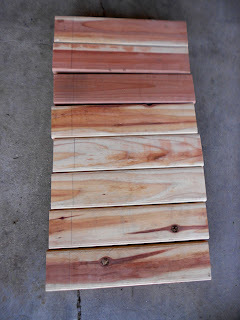 To cut the smaller sides (3ft) take one of the 8ft boards and mark two 3ft lengths (you will not use 2ft of the board). Do this again for one more board. 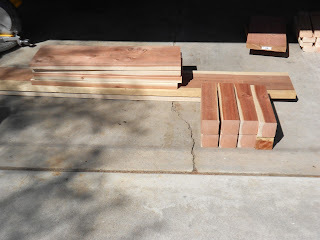 Then cut both boards. We had to flip the boards to get the length cut. You will now have #4-3ft boards. Next take the 4×4 board and starting at one side make a mark at 15″. 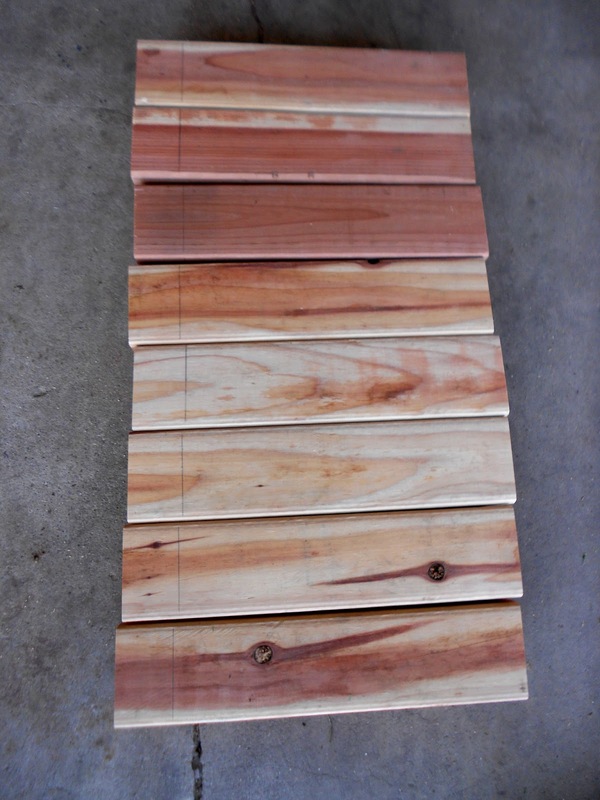 Cut then mark another 15″ and cut, keep doing this for the length of the board. You will come out with #8 poles. This is how much I had left after this. Here is the amount of wood left over. Now you will take your pencil and mark your 4×4 post. Mark 2″ down from the top of each post. Turn every post one direction (rotate once) and mark 2″ again. This line is were your boards will line up on the post. This part you do not have to do but I wanted everything to look the same. Now mark the boards were the screws are going to be placed. Follow photo for markings. UPDATE: On the longer side- 8ft, drill holes for two more screws, closer to the edge of the board (two boards meet). Next drill a hole into each mark, make sure the drill bit is smaller then the screw. Doing this will help the boards from not cracking when placing the screws. Take the 3ft board and place on the post, lining up the edges and the line you marked earlier. Make sure the other line is facing the side were the other board will go. Then drill in the screws. You will do this for both sides of the board and for all #4 boards. Next is adding the 8ft board.Stand the 3ft board up and place the 8ft board on top (Make sure you remember what board you want showing). On one side of the 8ft board, line up the board on the marked line and against the edge of 3ft board. After lining up the boards, like picture below. You can drill in the screws. Do the same thing for the other side of the board, you will maybe have to add a bit of pressure (two people would be nice for this part). After you get both sides of the board done, flip around and repeat adding the other 8ft board. Do this for the number of boxes you are doing. Your garden box is now complete. Now we need to finish them up by adding some soil, here.